NASA’s Hubble and Spitzer Space Telescopes have captured some intriguing images of the faintest object ever seen in the early universe. It’s a galaxy which is believed to have existed some 400 million years after the Big Bang. This means the Galaxy was there 13.8 billion years ago. The faint image of the Galaxy has set huge excitement among astronomers at NASA and the team has named it “Tayna” which means first born in Aymara language. This is not the first time that Spitzer and Hubble have detected a galaxy from far off distance. But Tayna belongs to those class of galaxies that were formed some time after the Big Bang, which implies that the image can open a new path for studying the formation and evolution of the first galaxies. The newly discovered Tayna galaxy has a size comparable to that of Large Magellanic Cloud (LMC), a diminutive satellite galaxy of our Milky Way. Several possibilities can be drawn from the images. The faint object may be a galaxy in the making. It is perhaps creating stars at a rate ten times faster than the LMC in order to grow into a full formed galaxy. The revelation has been published in the Dec 3 issue of The Astrophysical Journal.”Thanks to this detection, the team has been able to study for the first time the properties of extremely faint objects formed not long after the big bang,” said lead author Leopoldo Infante. Infante is an astronomer at Pontifical Catholic University of Chile (Pontificia Universidad Católica de Chile). In space, there are natural magnifying glasses which aid the visibility of these far off faint objects. 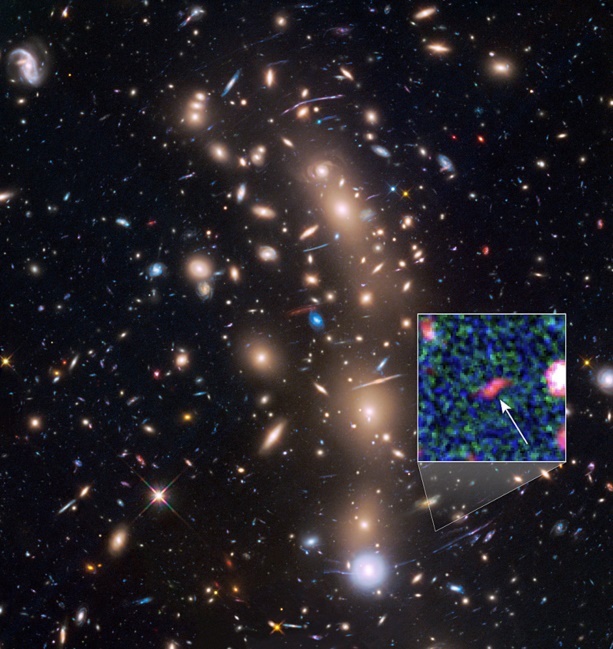 The Hubble telescope had observed in the past a cluster of galaxies MACS J0416.1-2403, located approximately 4 billion light-years away and weighing as much as a million billion suns. This cluster of galaxies act as a powerful natural lens and they refract and bend light from far off galaxies and other heavenly bodies.